The Nordwand, and the epic battles for the first ascent, has guaranteed the Eiger both a place in history as well as fame. 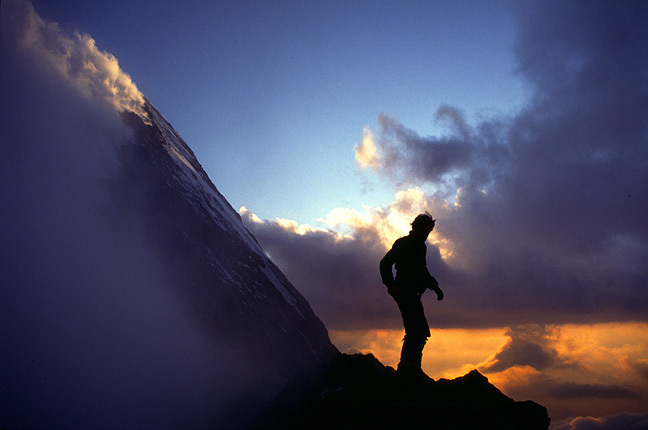 And certainly this fame has drawn many climbers to the peak. Fortunately for most of us, the mountain also has two very good more reasonable alpine routes, well known an justifiably popular. The Mittellegi Ridge is one of them, and the South Ridge is the other. Rising from the east, the Mittellegi Ridge is a beautiful, finely sculpted arête overlooking the North Face on one side, and overhanging spectacularly on its south side. The route follows the arête to the summit through towers and horizontal sections, at a difficulty of up to 5.7. 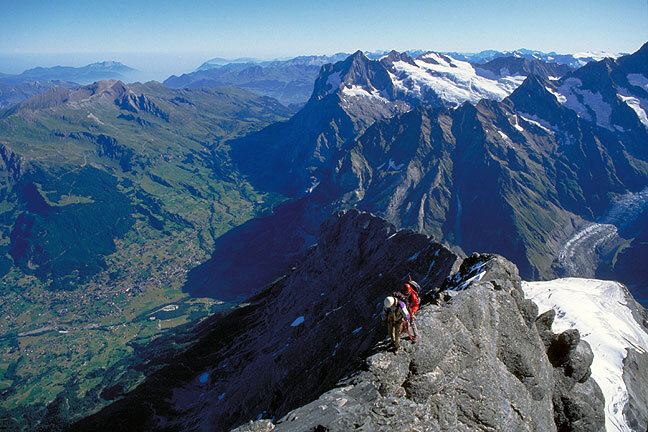 An ascent of the Mittellegi Ridge requires 2 days from Grindelwald. The first day is relatively short, taking the cog railway to the Eismeer station high on the mountain, then traversing a short section of glacier and some belayed rock climbing to the bivouac hut at the base of the ridge. The 3 pitches of rock climbing just off the glacier contain some of the most technically difficult pitches on the route. 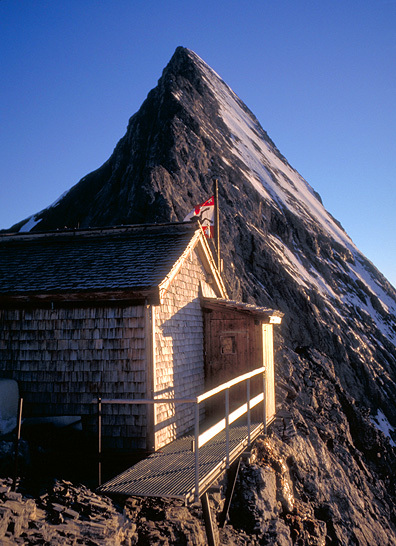 The Mittellegi Hut is perched spectacularly on the narrow crest of the ridge. Normally our climb starts about an hour before sunrise. This is one of those climbs where you want an early start to allow time for the long descent, but its not a good idea to start too early as the rock climbing along the ridge crest is certainly more of a challenge in the dim light of a headlamp. Perhaps there is some consolation in that the tremendous exposure is hidden from us until dawn. The route follows the ridge crest, or very close to it, for its entire length, climbing along the airy arête, turning or ascending directly the many towers encountered. There are several hundred feet of thick fixed line which greatly facilitates climbing some sections, particularly those that venture out onto the icy north side of the ridge. The last part of the climb ascends a snowy crest (exposed!) traversing above the final exit ice slope of the classic North Face Route. Descent is either by the South Ridge or the West Flank. Both descent routes are long. The South Ridge is far more technical (and perhaps a bit longer) but less exposed to rockfall. Normally we prefer to descend the South Ridge, but occasionally conditions on the West Flank may be preferable. All in all, the Mittellegi Ridge is a long day, beginning at about 4 or 5 in the morning and finishing a tiring 12 hours later. 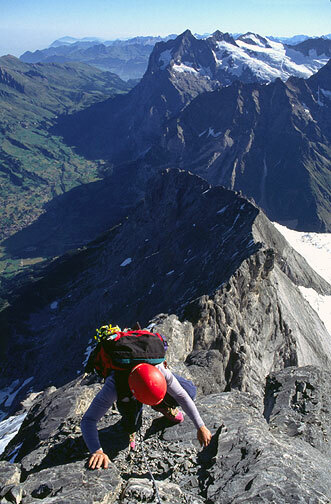 The Mittellegi Ridge is a classic alpine rock route. There is a glacier approach, and a fine snow Arête at the end, but most of the difficulties are on rock. There is fairly challenging rock right off the glacier, perhaps to about 5.7, but climbed in mountaineering boots. And higher on the route there is much mid-5th class rock, some of which we may climb in crampons. The descent is quite long, usually taking longer than the ascent. This is a route for skilled alpinists only. You should be able to climb rock in big boots of a difficulty of about 5.7. Also, the large amount of more moderate, but very exposed terrain requires an ability to move easily on narrow ridge crests. The Mittellegi hut serves only this climb. However, it is possible to do other climbs in the Jungfraujoch area preceding the ascent of the Eiger. For example, an ambitious and challenging 3-day itinerary might include the Mönch (by either the SW or SE Ridge), the Jungfrau and the Mittellegi Ridge, climbing the Eiger last.